I am a big of restaurant style gravies for various dishes. They are thick, luscious and really very flavourful. 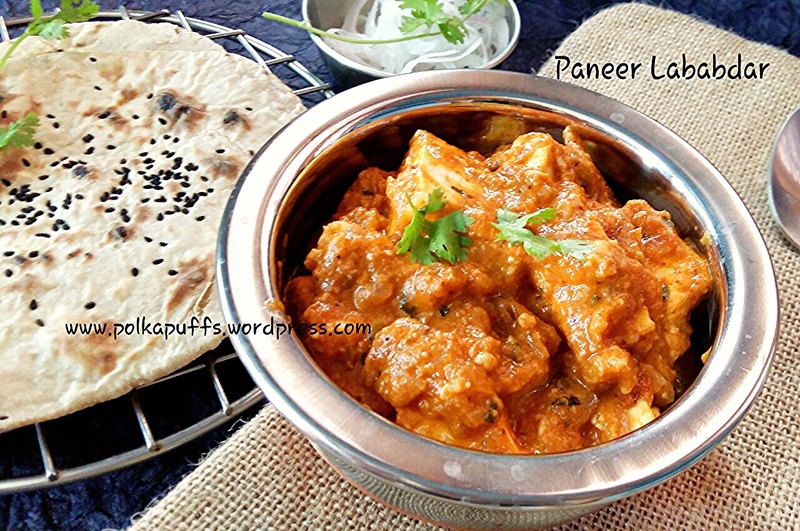 Specially Paneer (Indian cottage cheese). 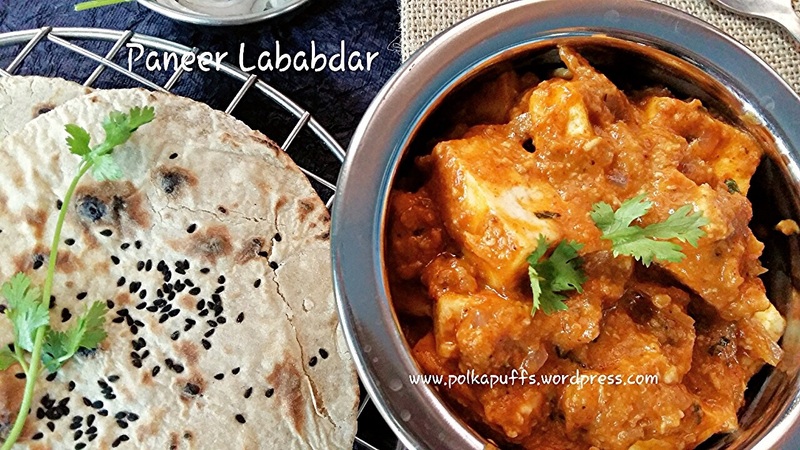 Paneer Lababdar is one such dish, it has a decadence of its own! And when paired with some Wholewheat Tava Naan, this combination is truly something to die for! If you too are fan of such dishes, then do try Reshmi Paneer or Dhabewala Palak Paneer 👌😉..easy peasy, mouthwatering dishes!! Equipment: a non stick pan, a blender, measuring cups/ spoons, a rolling board, rolling pin, a pair of kitchen tongs, a small saucepan, a pan for making the naan, a large bowl. In a saucepan, add water along with chopped tomatoes, garlic, ginger, cashew nuts, cloves & green cardamom. Bring these to a boil until the tomatoes have cooked and become soft. Add 2-3 tbsp more water if needed to cook them. Once done, cool these and make a fine purée. Set it aside. Heat butter and oil in the pan (skip butter if you are calorie conscious, use a little extra oil instead), add the asafoetida, bay leaf and cinnamon stick, sauté them for a minute. Then add chopped onions and cook until it turns golden brown. Once it’s golden brown, add the tomato-cashew purée and mix well. Keep cooking these together until the oil separates from the purée. This will take about 7-8 mins. Next add the coriander pwd, cumin pwd, degi mirch & turmeric pwd. Sauté them for about 5 mins. Also add salt, sugar & 1/4 cup water (if required) at this stage. Mix well and cook for another 5 mins on low flame. In a large bowl, add wholewheat flour and use a little water at a time to make a soft dough. Grease the dough with ghee well and let it rest for 30 mins. Keep the pan to heat on low flame. Next, make large balls using the dough (about the size of an orange, I could make 6 such balls), dust the ball with some flour. Using the rolling pin and board, roll this ball in oblong shape and about 5-6 mm thick. Sprinkle some kalonji seeds and press well with the rolling pin. Now, apply some water on the other side of the naan which isn’t covered with kalonji, and put the watered side down on the pan. Loved the recipe. ..ttasted better than what we eat at restaurants. ..tks much. .. I am so glad that you loved this…thanks for the feedback…😊 cheers! 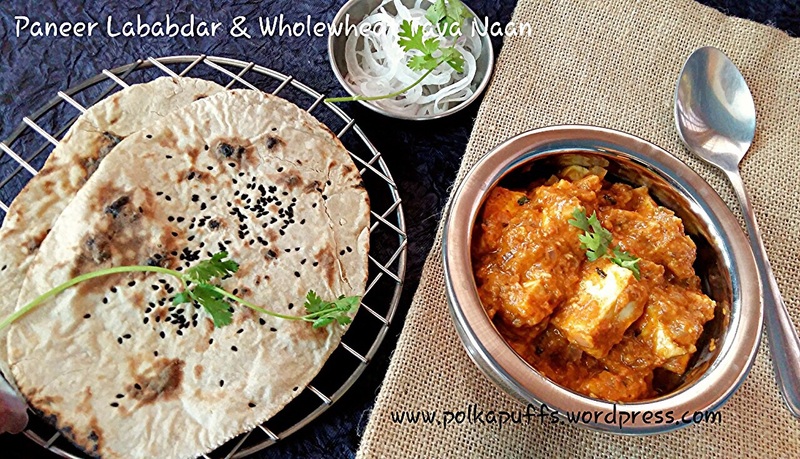 Pingback: Restaurant Style Shahi Paneer | Polka Puffs! 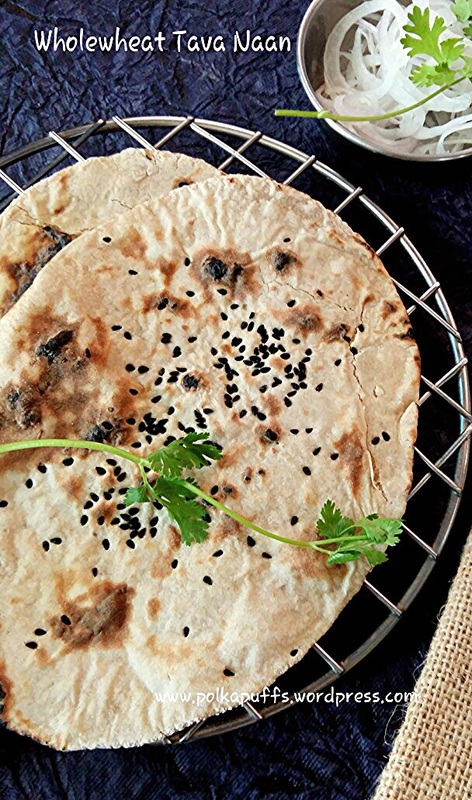 Pingback: Tandoori Aloo Ka Paratha | Polka Puffs!